Pretty much everybody and their brother have come out with a thin or shallow woofer. For the most part these thin woofers sound pretty good too but keep in mind that for the most part they are an “application” speaker for which you will be paying more for. By “application” I mean that the thinsters can fit into spaces where their big, fat brothers can’t. What some people don’t understand is that for the most part the regular sized woofers will sound better and hit harder than the thin versions. Don’t confuse price with output. Just because you pay more for a shallow speaker does not translate into it hitting “harder” or sounding better than the regular size. The reason you’re paying more for a thin woofer is because it is a shallow speaker and is for applications like fitting under the seat of a late model Ford F250 where there is very little room to mount any damn thing much less a woofer inside an enclosure. Lots of time and money was spent to figure out the optimal components of these shallow drivers. With the shrinking interiors of vehicles it made installing any type of subwoofer in a late model truck especially difficult and the result being “Janky” with the box taking up the whole floor or having to be set on the back seat. 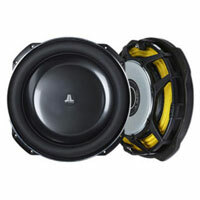 Now I have some love for the JL Audio 13TW5 with its 7″ voice coil but it is a little spendy @ $700.00. Good news is JL is going to add a 10″ to the TW line sometime this year. What really stands out is the Rockford P3 shallows with a 10″ and 12″ that sounds damn good for a thinster. Come in and judge for yourself I have them side by side for you to hear for yourself. But what’s way better than a floor model demo is let’s hear them in your vehicle…Hell it only takes a few seconds to hook a think woofer up if you already have a amp and sub set up in your car or truck. It is really a good indicator if these thin woofers do sound better or as good as the regular sized woofers. We encourage you to evaluate subs this way instead of hearing them in a huge show room. Doing it this way you will easily hear the differences between the brands and various sizes of woofers. So trip on down.